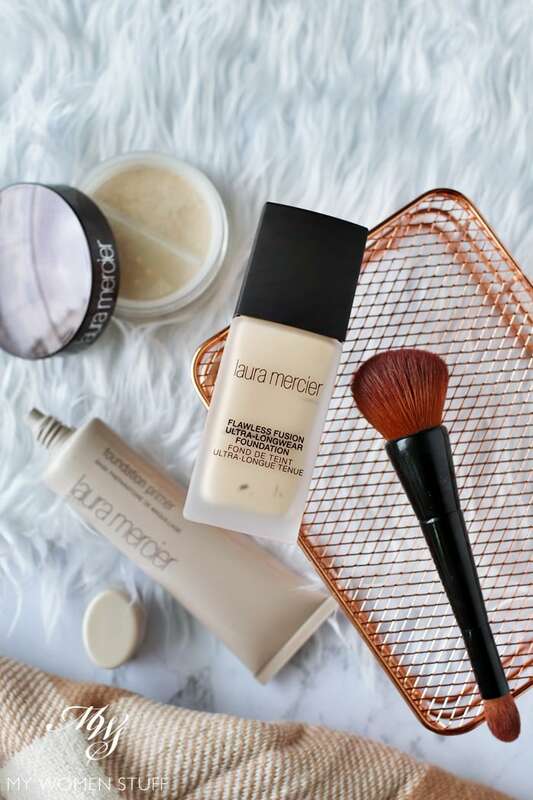 Home » Face » Foundation » Might the Laura Mercier Flawless Fusion Ultra-Longwear Foundation make a cameo appearance in my list of favourite foundation? 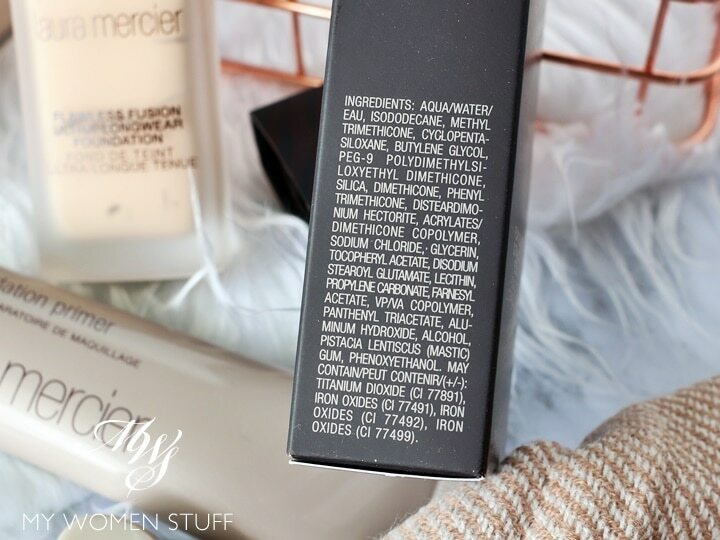 Might the Laura Mercier Flawless Fusion Ultra-Longwear Foundation make a cameo appearance in my list of favourite foundation? There was a little scare among Laura Mercier fans here in Malaysia, that the brand was pulling out of the country. Well, take heart, they aren’t! It was just a change in administration, and they are here to stay. And we know that Laura Mercier is known for their base makeup – their Flawless Base, as they call it. So what better way to join the trend of high coverage, long-wearing foundation bases, than with the Laura Mercier Flawless Fusion Ultra-Longwear Foundation. The Laura Mercier Flawless Fusion Ultra-Longwear Foundation was launched about a year ago, and you may notice the subtle change in packaging. In fact, Laura Mercier has since been rebranding themselves, and they now sport a brand new logo, with a brand new font. You will be seeing it roll out in future releases, and their bright, spanking-new stores will also sport it. More modern, more with the times. But I had to know – were they still as strong in their base products as I remember them to be? Earlier this year, I noticed a trend for foundation to have higher coverage, and be long-lasting. I noticed this in 2 new releases from NARS and Bobbi Brown. There were other brands also supporting this trend. I will say up-front, that this is not my preferred style of foundation. I prefer a lighter, sheerer texture, with a touch of glow to it. But I will attest to the fact that it is longwearing, and did stay put on my skin for hours on end. For a longwearing foundation, I do not find it to be drying on my dry skin. That is a good thing. However, I must also say that I did not find it to be particularly flattering either. For some reason, it did not look as natural as I like it to. I say this by bench-marking this against the Nars Radiant Longwear Foundation and also the Bobbi Brown Skin Longwear Weightless Foundation, both of which are high coverage foundations with longwearing claims. With both the Nars and Bobbi Brown, I find them to be fairly weightless on my skin, long-lasting, and feel and look very natural. 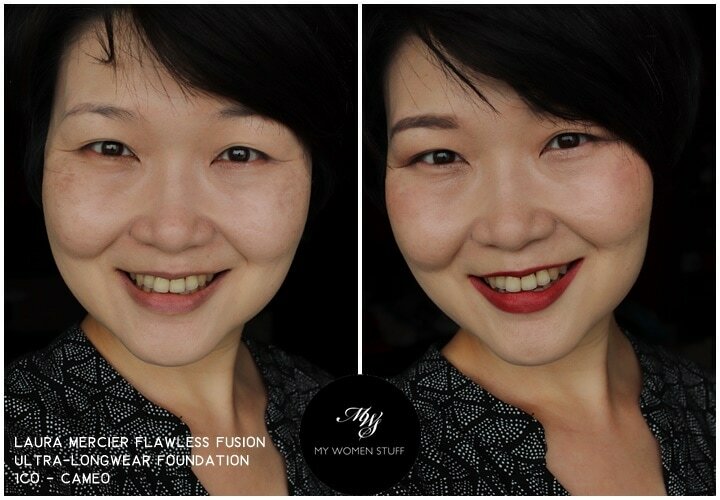 With this Laura Mercier Flawless Fusion Ultra-Longwear foundation, I knew I was wearing foundation. It isn’t heavy, and it blends easily, but I knew it was there. In terms of coverage, it boasts a medium to full coverage, which I can attest to. I rarely ever wear full coverage makeup, so I tend to apply it rather sparingly. In that sense, the pump does pump out more product than I like, which results in wastage. Unlike the Nars and Bobbi Brown foundations, I found that this Laura Mercier Flawless Fusion Ultra-Longwearing foundation applies best on skin with a foundation brush. Fingers left it looking more streaky, while a brush blends it in better. I wear the shade 1CO – Cameo, which happens to be the lightest shade in the selection. There are 30 shades available, with a decent selection of deeper colours, and shades with different undertones, so you can get a good match. In this before=after photo, I have applied it with medium coverage (because the pump pumps out too much product!) On normal days, I wear less because that’s my preference. The shade 1CO Cameo is a good shade for me, and has slightly pink undertones. These days, I prefer a more neutral undertone to my foundation, but unfortunately, the rest of the shades were too deep for me. You will see that with medium coverage, redness and most skin imperfections are covered, and skintone is evened out quite noticeably. The finish is supposed to be matte, although to me, I’d say it is semi-matte. You do need a touch of colour on your skin to look more natural. So, to give you an idea of how it might look once I have my makeup on, here is a picture which I took for the Chanel Rouge Allure Liquid Powder post. I had a touch of concealer on, some Hourglass Ambient Lighting Powder, Charlotte Tilbury Bronze & Highlight Palette with a touch of NARS blush, brows, eye colour and the Chanel Rouge Allure Liquid Powder in Avant-Gardiste 960. You may notice that once the rest of the colours go on, it looks far more natural both in photos and in real life. 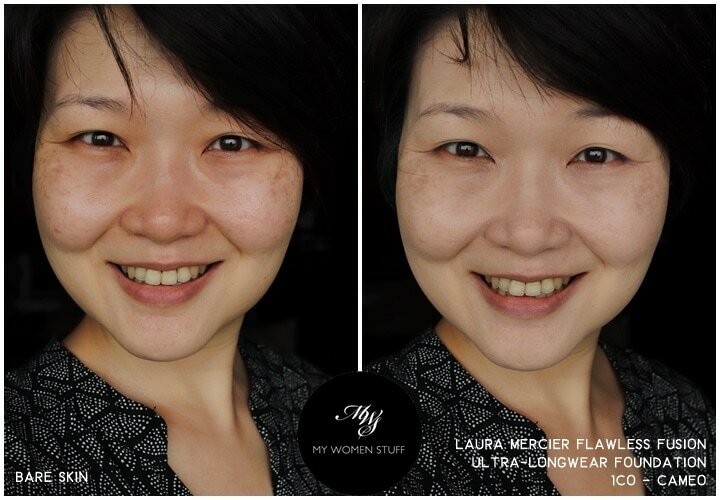 And I have to say that the Laura Mercier Flawless Fusion Long-wearing Foundation photographs very well. There is very little flashback, and it makes your skin look smooth and flattering. In real life however, I do not notice it settling into pores or lines, but depending on how much you use, it can potentially look a little heavy and cakey. If you use very little, then you may not notice it. But if you layer it on, it isn’t the most flattering of foundation, I’m afraid to say. 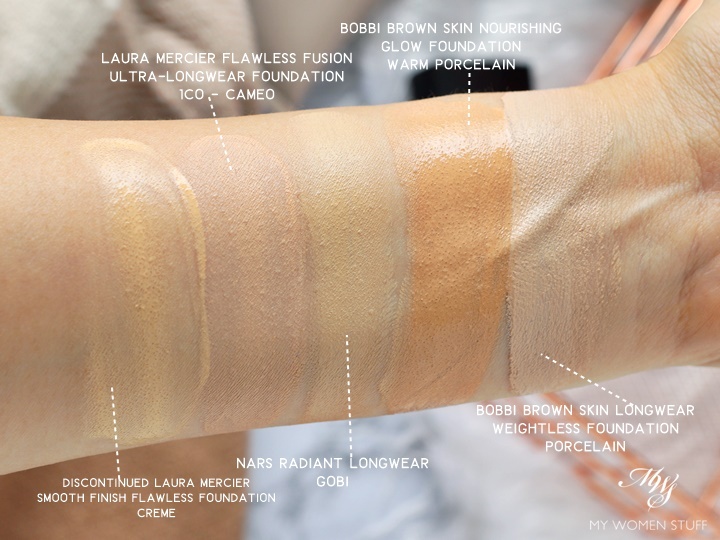 Here is a swatch of the Laura Mercier Flawless Fusion Ultra-Longwear Foundation in 1CO Cameo alongside some other foundations I wear. I have picked those that are higher coverage, so it is comparable. While the shades look rather contrasting, I can wear them all quite naturally, strangely enough. But you may want to notice that both the the Nars Radiant Longwear foundation and Bobbi Brown Skin Longwear Weightless foundation is of higher coverage than this Laura Mercier Flawless Fusion. The Bobbi Brown Skin Nourishing Glow Foundation boasts a high coverage as well, but gives skin a glow that is incredibly flattering. I also note that when it dries down, the Laura Mercier Flawless Fusion foundation looks a little more dull, and more matte than the rest. If a very matte look is what you go for, then this will be the one you should pick. I personally don’t go for that sort of look, so it isn’t my favourite. I think this Laura Mercier Flawless Fusion foundation is one you might want to pick if you have to wear your makeup for long hours, want something oil-free and matte, with medium coverage, and needs to photograph well, or looks good under dim lighting. But if that isn’t your cup of tea, then there are better options out there, in my view. The Laura Mercier Flawless Fusion Ultra-Longwear foundation is a medium to high coverage liquid foundation, with an oil-free, matte finish. It boasts up to 15 hours of wear, which is credible. I don’t experience much problems with it, in terms of settling into pores or lines, and it does not seem to be drying on my dry skin. However, I do find it to be a little too matte for my preference, and not as lightweight as I’d like it to be. It can also be a little streaky if you blend with fingers, so a brush or sponge is preferable. On the upside, it photographs very well. If you’re interested, here is the ingredient list for the Laura Mercier Flawless Fusion Ultra-Longwear foundation. Does this Laura Mercier foundation interest you? 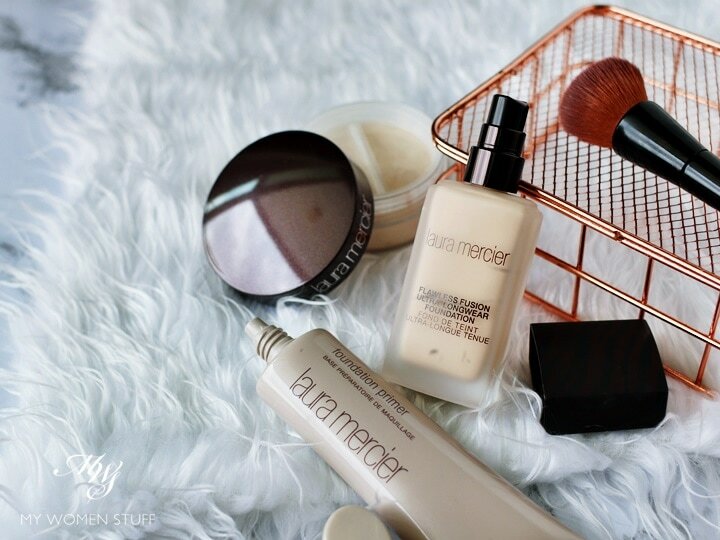 Have you tried any Laura Mercier base products? PREVIOUS POST: Uniqlo Wireless Bra : My phone is now wireless – why not my bra? What would be your recommendations for long wear foundation with glowing effect since I wear at least 10 hours each day? My skin type is dry and I can’t seem to find a good foundation that don’t cake on my dry skin. I have been using Estee Lauder double wear and would like to try something new. The other tip I have, if you have dry skin, is to not wear a foundation with too high coverage – this adds to the cakey texture. Instead, consider a medium coverage product, top up where you need with concealer, and use powder if necessary to layer for better, more natural results 🙂 I’ll share how I do it in a future post 🙂 Hope this helps! Thank you for your recommendation. Will definitely try out those that you have mentioned. And pleaseee show how you use powder to do layering. Can’t wait for your post. Thank you Lisa 🙂 It’s not how I use powder per se, but how you layer, that helps with coverage without applying a lot of foundation 🙂 I’ll work on it! Thank you. Your posts, are always helpful. Big hugs from Greece. I swear on their candleglow foundation. Its the ONLY foundation ( i have tried from high end to drugstores) that doesn’t break me out. Free of silicones and talc, its sheer and wearable. Holy Grail. Thank you Angie! I’ve heard very good things about the Candleglow foundation too! I shall have a look next time I’m at the counter – thanks for reminding me. I’d been meaning to check it out for a while! I love with Laura Mercier product. And can you share, if you already put your skincare + sun screen, how you apply primer and foundation? Is it after skin care, no need to apply hydrating primer since it would overkill? Or if we apply matte primer is it will contradict with the skin care that we’ve applied? I try to play around with primer. If skin care not fully absorb (need to wait some time) and add primer + foundation, its a mess.. I not sure if I need to skip this primer. Because until now, its hard to see any difference with/without primer. Hey Christina 🙂 Ok, the truth is, I rarely wear primer. The reason is because I don’t see a point for it, which is the straight truth. I have dry skin, so what I do is to prep my skin well with skincare, then my sunscreen. Very rarely do I find the need to use a hydrating primer after that, if my skin is already well hydrated and moisturised. If you find you have oily parts of skin eg nose, forehead, chin, then a tiny dab of mattifying primer can help. It won’t cancel out your skincare, because it sits on top of all that, and absorbs the oil.